Get full control over your e-commerce website. Build eCommerce features that deliver custom experiences. Looking to scale your web store without being tied down? Our eCommerce website builder will give you full control over every element of your online store. From design and customer experience to hosting and marketing, our simple admin portal puts you in the driver’s seat – even if you’re not a techie. Thanks to our e-commerce platform that’s fully customizable, 100% open source, and loaded with all useful enterprise eCommerce solutions that every online merchant needs. There’s no need for a separate mobile commerce storefront — our brand-new eCommerce site builder with Crisp White skin automatically adapts when opened on a phone or a tablet. It will make your online store look great on any device with no extra coding or design tweaks so you can build an online store in a fast, cost-efficient way. Browsing our theme store will show you 5 FREE color ideas for your store and 84 clean themes – stylish, responsive, fully customizable and well-suited to all eCommerce businesses. Easily edit your store’s look & feel in Layout editor mode — change the position of the blocks by grabbing and dragging them to a new place, or choose a pre-made layout type. Due to responsive mobile optimized website design, X-Cart online shopping cart (in contrast to other eCommerce platforms out there!) passes Google’s "mobile friendliness" check without a hitch! Plus enhanced shopping experience translates into better SEO and conversion rates. Looking to create a unique custom-made design from the ground up? Help from certified experts is just a click away. 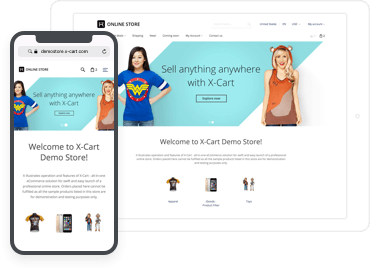 X-Cart web designers will easily make your online store friendly to mobile devices, create a unique custom-made mobile commerce design that stands out, optimize it for all browsers & retina displays, materialize just about any business idea you’ve got. Select a web design plan for your needs. Compared to other online store builders, our user-friendly interface boosts your conversion rates like no other. Because today’s consumers are not completely satisfied with eCommerce sites that just allow them to shop, we’ve improved the usability of our e-commerce solution to build a competitive advantage. Let customers find your physical or digital products through lightning-fast cloud search that enables real-time suggestions, spell-checking, support for synonyms, promotions and statistics. Enhanced user experience translates into better SEO and conversions — visitors get the content they want, in a format they can read. We let you decide how and where to set up your blog. Subdomain? Subfolder? No problem! You can also display your products inside any existing WordPress site. Show product prices, shipping costs and totals in the currency your buyers are used to. 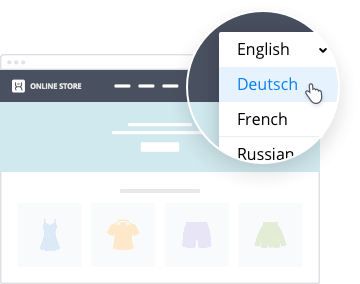 Translate the storefront and catalog to 40+ languages and, if needed, set right‑to‑left typing to make your online store closer to your audience from around the world. Everything is SEO friendly, so both your customers and Google will love it. Choose an X-Cart Edition for your online business. Unlike other eCommerce platforms for small businesses such as Shopify, you can run our e-commerce platform anywhere. You can run your eCommerce site on our servers or one of our partners. We constantly allocate 2 CPUs to process your business operations, and the RAM you’ve paid for in your hosting plan will always be available, regardless of the physical machine’s activities. Pick a hosting plan that fits your business needs. Compared to traditional HDDs, SSDs have lower latency, faster read/writes, and supports more "input-output operations per second". We provide one VPS server per client, hence no other account can go through and bypass your business data and customer information. Save valuable time on paperwork, keeping track of the products and variants in stock. See bestsellers and low-stock products on your dashboard to understand what your audience really loves. X-Cart’s Update Inventory module allows to update product quantity by SKU in bulk. Plus, you have the privilege to add in unlimited products! Do you need to import/export information to CSV format? Our eCommerce shopping cart software adds an opportunity to export and import data in .xls (Excel 5), .xlsx (Excel 2007), .ods (OpenDocument) formats. Packing your products with X-Cart eCommerce solution, you skip the middleman and reduce your packaging costs by up to 30%. You also save your precious time and money, as we offer overnight shipping of these supplies to almost all states of the US. And it is totally free. This feature will save you much time and energy dealing with a monotonous and time-consuming process of making similar changes in multiple products. Have product data and images added to catalog at one fell swoop, keeping it accurate and up-to-date. You don’t need to painfully invent descriptions for dozens of your products, just rely on those that others have created for you. The feature integrates your store with external product libraries such as Itemmaster, Aerse, Outpan, and Amazon, which contain high-quality product descriptions, images, and specifications from official sources. Loyalty program, all kinds of reminders, exit offers, an advanced banner system, and other online business tools will make every client a returning client. "Customers also bought" and "Recently viewed", cross-sell and upsell, new arrivals and "Coming soon", featured products and bestsellers will push customers to buy. X-Cart eCommerce business solution gives you all the tools you need to increase CTR and get your small business ranking higher in organic search results: clean and canonical URLs, configurable page titles and more. Conduct classic auctions, offer discount coupons and volume discounts, set wholesale prices based on customer membership levels. 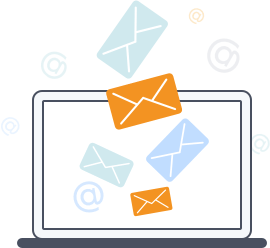 Ramp up your newsletters with MailChimp and unlock the hidden potential of your transactional notifications with Mandrill. Our platform can also send out beautiful abandoned cart emails to remind your customers of their pending purchase. Put product ratings and reviews at your customers’ fingertips. Like, Tweet, G+ and Pin buttons make it easy to share content and get acquainted with friends of your friends in social media. Mobile devices are now an integral part of our daily lifestyle, with people spending nearly 90% of their mobile time in-app. It means that mobile-only deals, location-specific deals, mobile loyalty program and timely push-notification promos will definitely enrich your marketing arsenal. X‑Cart has a number of options for tracking statistics, like Google Analytics and Yandex.Metrica, Mailchimp’s eCommerce 360 feature and eCommerce Google Analytics, Diib analytics, Segment, CloudSearch, and other useful tools in the app store, which will help you to turn insights into actions and improve your customers’ engagement by times. Make your online store closer to your audience from around the world. Show product prices, shipping costs and totals in the currency your buyers are used to when you start selling. Everything is SEO friendly, so both your customers and search engines will love it. Broaden your customer base and instantly boost online sales across multiple online marketplaces and social media networks, like Facebook, Amazon, eBay and Google shopping trusted by millions of online shoppers. Depending on your customer’s location, X-Cart e-commerce solution will automatically handle applicable country and state taxes. Translate the storefront and catalog to 40+ languages and, if needed, set right-to-left typing. Two different modes are meant to draw the line between those businesses who store their goods in a single warehouse and those who ship products from separate multi-location warehouses. However, the process is absolutely hassle-free for your customers — no matter how many vendors there are, the order is paid just once. Several independent product providers share a single "virtual mall" for selling their goods and services — with a single storefront, a single cart and a single checkout. Each provider manages their own products and orders independently of other providers via a personal password-protected account. Root Administrator account controls every aspect of the ecommerce store and moderates the accounts of individual providers and the goods they are selling online. Accept payments for an unlimited number of products from different suppliers within a single interface and automatically split the total amount into several parts. Admin gets the commission, the vendors — their payments. 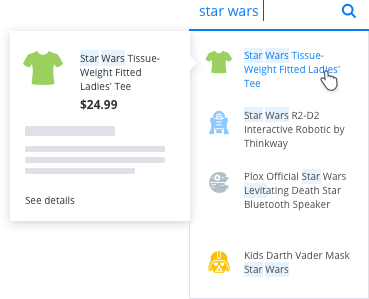 Advanced product search and filter (similar to Amazon and Google Shopping), "shop by vendor" feature, vendor info, photo and order messages make it easy to engage people browsing the website. And a single payment checkout makes the retail experience as simple as microwaving a bag of popcorn. Why should your customers constantly guess what companies are good or bad, reliable or untrustworthy? Tag trusted and non-trusted vendors to help your customers shop smarter. A significant number of international gateways, such as PayPal, Sage Pay and Authorize.net allow you to accept payments from all over the world in multiple currencies and languages. Allow orders to be placed without account registration, while easily tracking all "anonymous orders" assigned to the same email address. 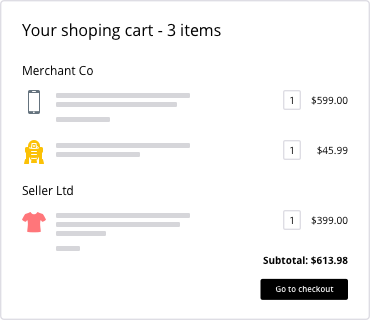 Splitting X-Cart checkout into several steps, Multi-Fast Lane Checkout makes the whole buying process easier and more user-friendly. 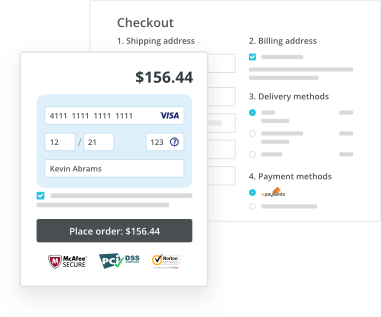 X-Cart shopping cart makes PCI compliance easy whether customers check out right from your storefront via a merchant-hosted payment page or are redirected to an external payment solution hosted checkout page. In any case, credit card data is in a secure location. Our ecommerce website builder’s powerful anti-fraud tools will secure your business against online scam and keep your small business safe, no matter what. Financial transactions require profound security measures. HTTPS/SSL support for secured connections and safe checkout as well as cryptographically strong SHA 2 are here to encrypt your customers’ sensitive data. "Pay with Amazon” and “PayPal Express Checkout"
Enable "Pay with Amazon" and "PayPal Express Checkout" buttons to make the checkout process even more speedy and reduce customer wait times. Host the payment page right on your website and access more than 50 payment processors with PCI level 1 certified payment application X-Payments. By supporting tokenization, it allows for recurring payments and subscriptions as well as PCI-compliant "storage" of credit card details. 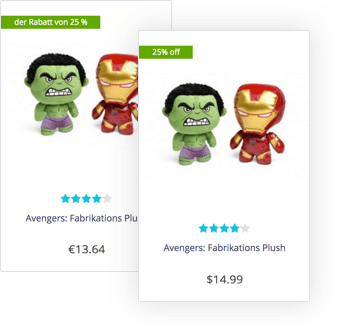 Do you need more power over your ecommerce store? Upgrading your ecommerce shopping cart software is as easy as getting started. With just one-click, you’ll have a secure, nicely designed website that will boost traffic and credibility of your enterprise, medium, or small business online. 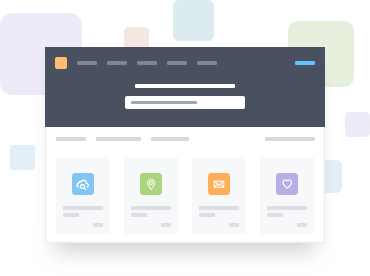 Install addons and design templates in a couple of clicks, just like in Google Play or App Store, and instantly enjoy your new ecommerce opportunities! Flexible modular architecture allows you to tailor the eCommerce platform to your precise needs without affecting the core. Equipped with the latest architecture in web technology, your backend portal supports MVC with hierarchical widgets. Front-end, on the other hand, encompasses fast and dynamic client-side widgets built with MVVM in mind. X-Cart shopping cart also provides several caching layers (data cache, widget cache, query cache) ensure outstanding performance. REST API module works securely with the store data without direct access to the server. Hold the latest news about X-Cart shopping cart and share your thoughts on a constantly updated and carefully monitored forum. This visualizes the hierarchy of templates and shows different kinds of logs, such as script execution time, SQL queries and memory usage. 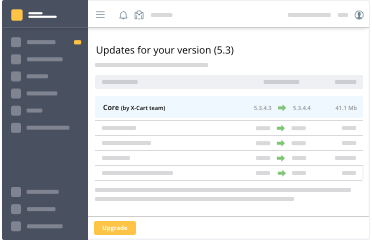 Everything you need to know to manage your X-Cart 5 online shop is stored in our developer documentation (if you prefer to read) and video tutorials for using our ecommerce software (if you’d like to watch). X-Cart tech guys are ready to give you a hand 24 hours a day, 7 days a week, all year round at an affordable price. Unlimited requests. Up to 30 min response time. The best place to discuss business projects, manage orders and subscriptions is clearly our Help Desk System — all your communication with our company staff is saved there for future use. For quick questions, just drop us a line or two via email. Phone support and live chat support services are also available. is cram-full of step-by-step instructions and video tutorials on pretty much anything related to X-Cart shopping cart. Loads of insightful tips on how to sell online successfully with X-Cart shopping cart and grow your customer base. Work with designer, developer, and SEO guru who can help grow your eCommerce store and make use of our partners’ expertise to your benefit. Enjoy a pack of ready-made features built for you to save time and energy. No need to code anything. Create an awesome online store in a few seconds!